COLUMBUS, Ohio, 14 November 2018—SocialVentures and Better Business Bureau of Central Ohio (BBB), in collaboration with Measurement Resources Company (MRC), are advancing a pilot program to develop a new service that will review, validate, and communicate the social impact created by social enterprises in Central Ohio. Thirteen social enterprise pilot participants will market test a new seal with consumers. Prior to launching the pilot, SocialVentures partnered with Lextant to conduct consumer focus groups. Focus group participants expressed a desire for the social enterprises they support to live up to their claims, and underscored that the combination of integrating social impact into the business model and providing a dependable product or service are two components that help create trust around the organization’s work. SocialVentures, in partnership with the BBB, and in collaboration with Measurement Resources Company (MRC), launched its Pilot Product Development Group in January 2018. “This validation program is designed to connect social enterprises with consumers, advisors, and investors, and to demonstrate that their reported social impact is legitimate,” said Allen Proctor, president and CEO, SocialVentures. Building on the BBB’s established position and expertise in managing a large-scale business review and certification programs, the pilot program will further advance BBB’s mission of helping consumers find businesses and charities they can trust. “Social impact is important. 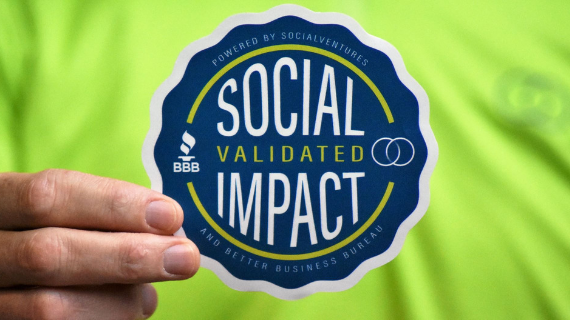 Social impact validated is responsible business in the public interest,” said Kip Morse, president, BBB. The validation program leverages MRC’s previously tested and implemented Social Impact Measurement Framework to use a focused set of metrics specifically selected to address the missions of social enterprises. The pilot launched in January 2018, and will continue through June 2019, with the goal to publicly launch the service to social enterprises and nonprofits in Central Ohio in the latter half of 2019. All 13 organizations participating in the Pilot Product Development Group have successfully achieved validation and will now begin to market test this designation by integrating a seal throughout their marketing, fundraising, and consumer outreach initiatives. Thirteen leading Central Ohio nonprofit and social enterprises led by 10 professionals serve as members of the Pilot Product Development Group and will now market test the validation service. Consumers will see the validation seal appearing on the products and marketing materials of the social enterprises and will have their validated social impact statements featured on the BBB website, as well as on SocialVentures’ online Marketplace. Founded in 2014, SocialVentures advances remarkably good businesses—businesses that intentionally integrate social impact as a non-negotiable component of their business model. SocialVentures supports these nonprofit and for-profit businesses so that entrepreneurs, consumers and beneficiaries of their mission-driven endeavors are all better positioned to prosper. More information is available at https://socialventurescbus.com/. For more than 100 years, Better Business Bureau has been helping people find businesses, brands and charities they can trust. In 2016, people turned to BBB more than 167 million times for BBB Business Profiles on more than 5.2 million businesses and Charity Reports on 11,000 charities, all available for free at bbb.org. There are local, independent BBBs across the United States, Canada and Mexico, including BBB Serving Central Ohio, which was founded in 1921 and serves 21 counties in Central Ohio. For more information, please visit https://www.bbb.org/local-bbb/bbb-of-central-ohio. Measurement Resources Company (MRC) delivers data-driven services and strategies to government, nonprofit and social enterprise organizations eager to accelerate social change. Since 2008, MRC has helped hundreds of social sector organizations isolate the metrics that most effectively reveal the insights needed to improve outcomes, demonstrate impact, increase visibility, and raise funds. By combining best practices in industrial and organizational psychology, program evaluation, and data, MRC’s High-Performance Measurement Framework™ makes it easy for mission-driven teams to use data that can drive better outcomes.